I was provided a rug pad from Rug Pad USA for this review, but as always all opinions and thoughts expressed are 100% my own. Rugs are fabulous. 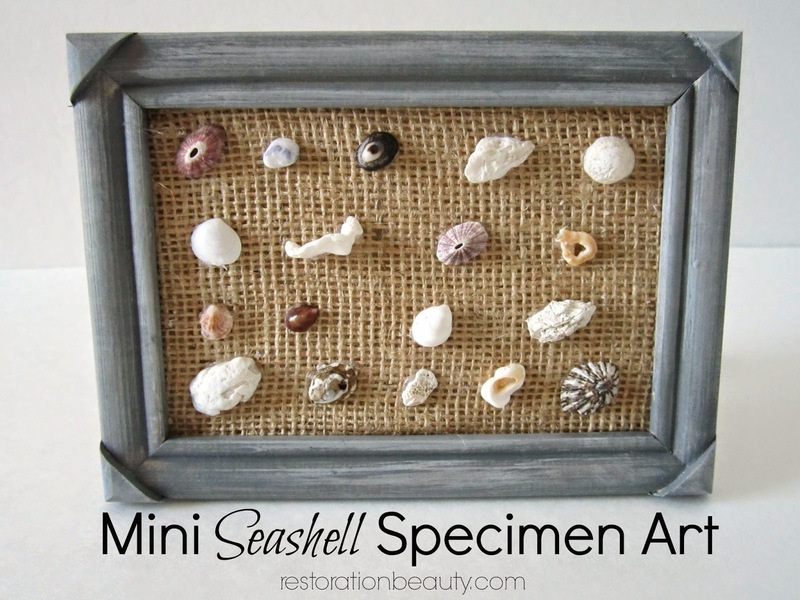 They add warmth, personality and style to any room and do an awesome job of dividing spaces within a room. And in my opinion, they complete a room beautifully. 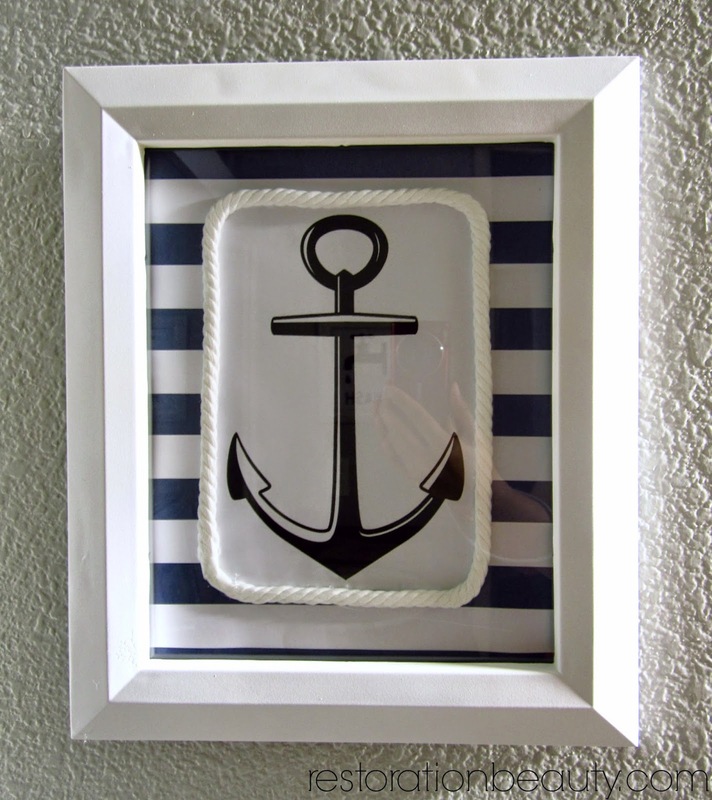 Not to mention, they come in different textures, patterns,styles and colors. They're just so much fun to pick out, right? 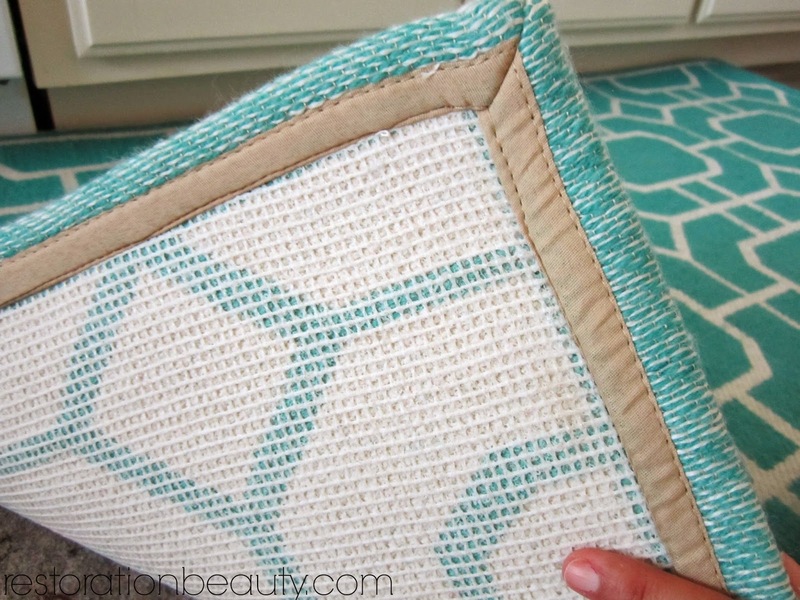 But as fabulous as they are, there is nothing more annoying than a rug that doesn't stay put! Or worse, a gorgeous rug that isn't very, um...comfortable on your feet. So you have your beautiful rug but it keeps sliding all over the place and isn't very comfortable to lay on or stand on, you say? 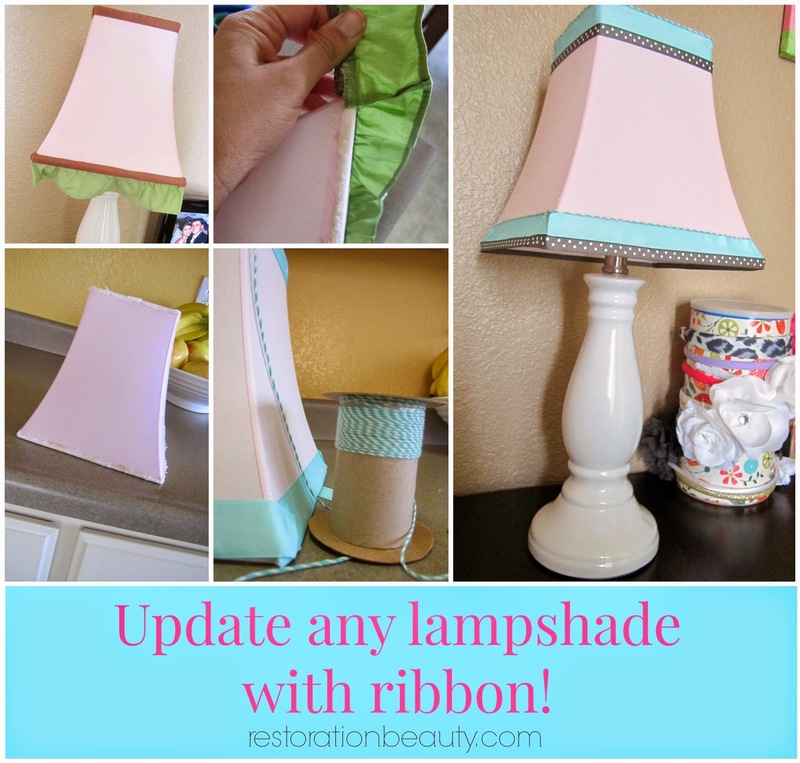 I did too, but now I have the secret to KEEPING MY RUG IN PLACE WHILE ADDING COMFORT TO MY FEET!! 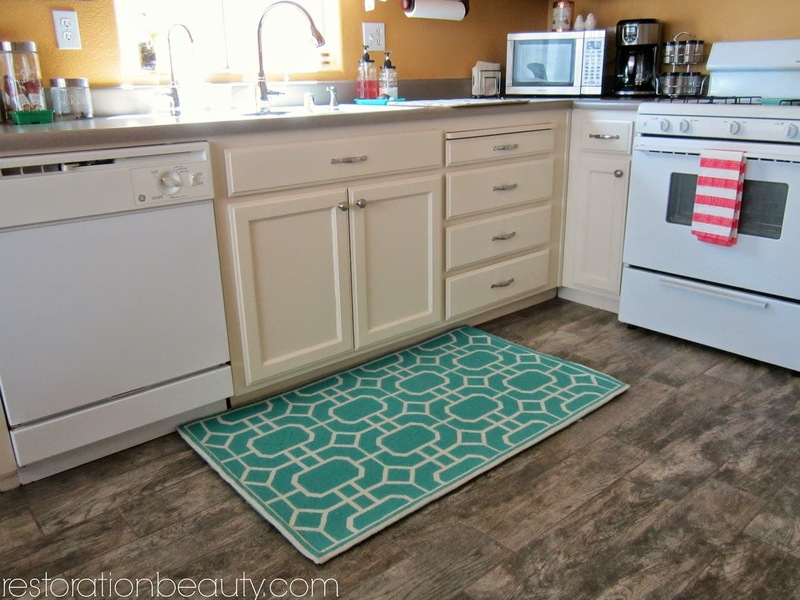 This is the gorgeous rug that was a dilemma in my kitchen. I know, I did a switcheroo on you guys! 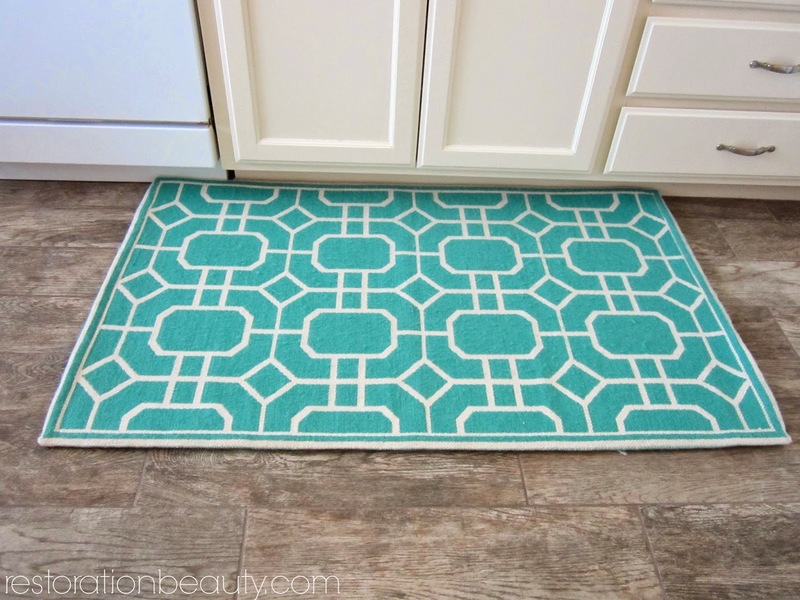 This rug used to be by my entry way but I switched it shortly after my Kitchen Tour. I'm known for that around here. My number 1 dilemma: it kept sliding all over the place! It was so annoying since I always had a cow if it wasn't perfectly centered. It either ended up too far to the left or too far to the right, but never seemed to stay put in the center where I would constantly position it. Sigh. It would also bunch up at the top. The other dilemma was the fact that although I LOVE the style of this rug, it is not comfortable to stand on....at all!! It sits in front of my kitchen sink so I spend a reasonable time on it while loading the dishwasher or washing dishes. I was even tempted to buy one of those memory foam rugs, but honestly... those are just u-gly! 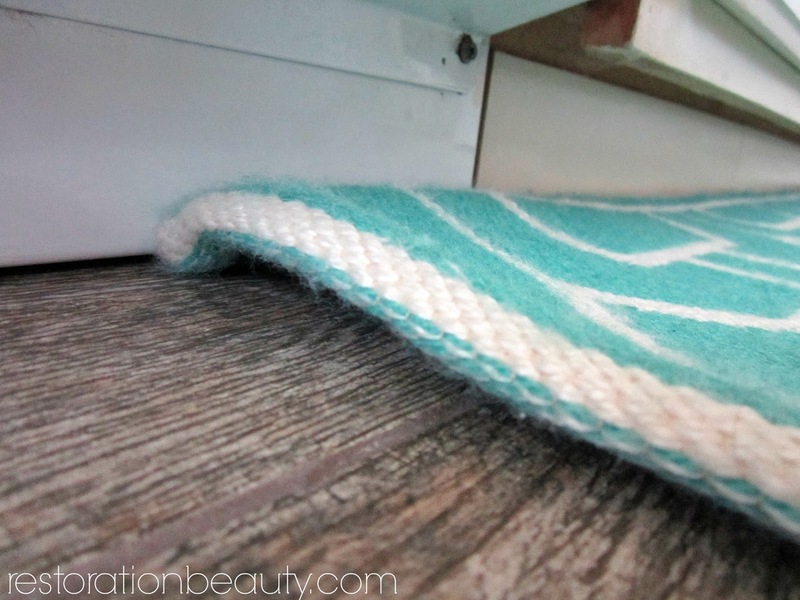 That's where this amazing Premium-Lock rug pad from Rug Pad USA came to save my rug... and feet! 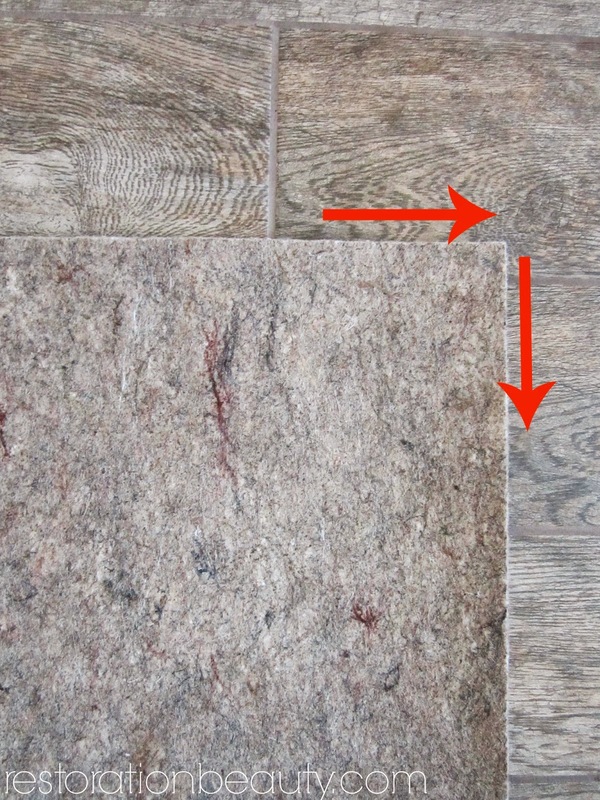 As you can see the top material is felt which clings to the back of your rug very nicely! I also love the fact that these rug pads are USA made, eco-friendly and are known to be durable and long lasting. And they don't have any strong chemical smell like most rug pads, which would have been a deal breaker since you all know I try my best to keep our home chemical-free. 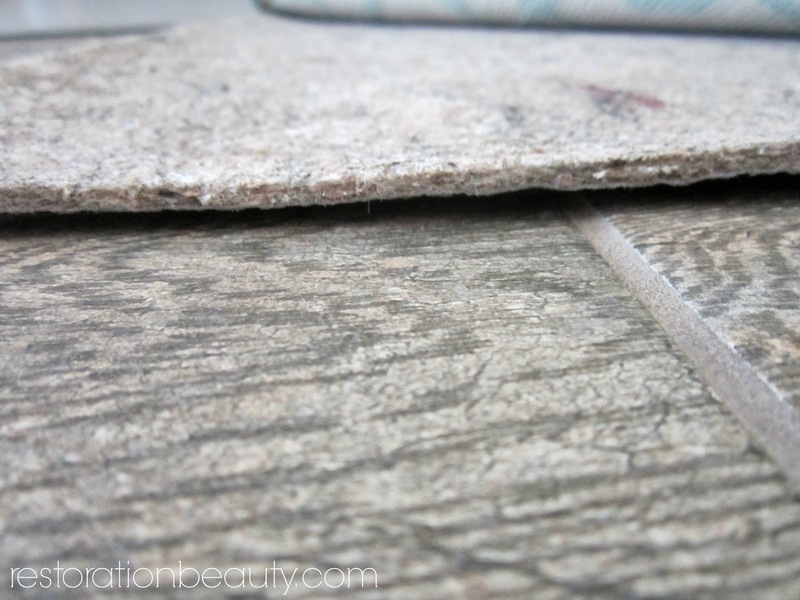 The bottom of the Premium-Lock rug pad is a grooved natural rubber not the usual synthetic latex used in most rug pads. It's meant to grip better and last longer. I can vouch for the grip! That baby stays put! You can see that my rug actually came with a built in "rug pad" that was obviously intended to grip to the floor with all those grooves. Yet, the rug would constantly slide. But not anymore! You can see that the rug pad isn't very thick, but my goodness, it sure does feel like it on my feet!! It is so comfortable to stand on my rug now when I'm doing the dishes or loading the dishwasher! It's like a treat for my feet and it sure makes washing dishes a little more rewarding.....other than having clean dishes to eat off of. I never knew that a rug pad could make me this excited! Every time I set foot on my rug I feel like doing a happy dance. It is just so comfy!! So now I get to keep and enjoy my fabulous rug without resorting to those ugly memory foam rugs!! 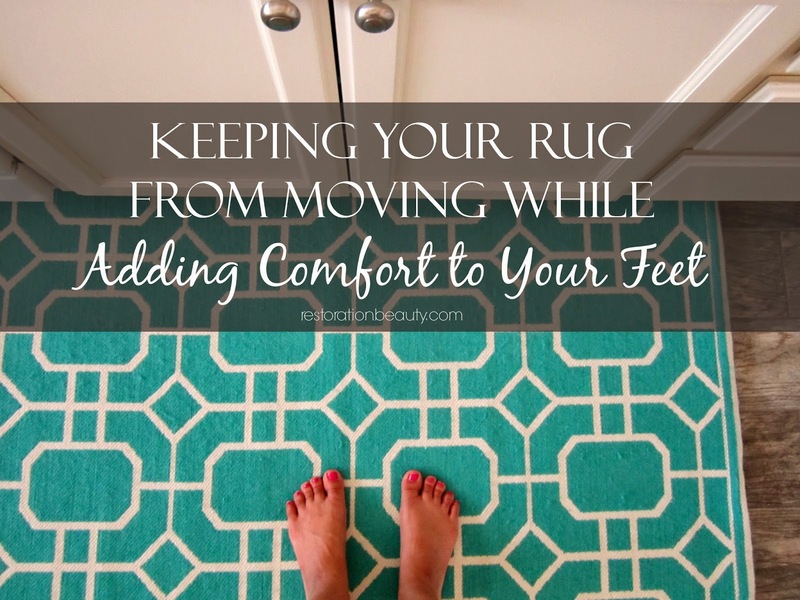 And..... you can keep your rugs from sliding all over the place while adding comfort to your feet, too!!! 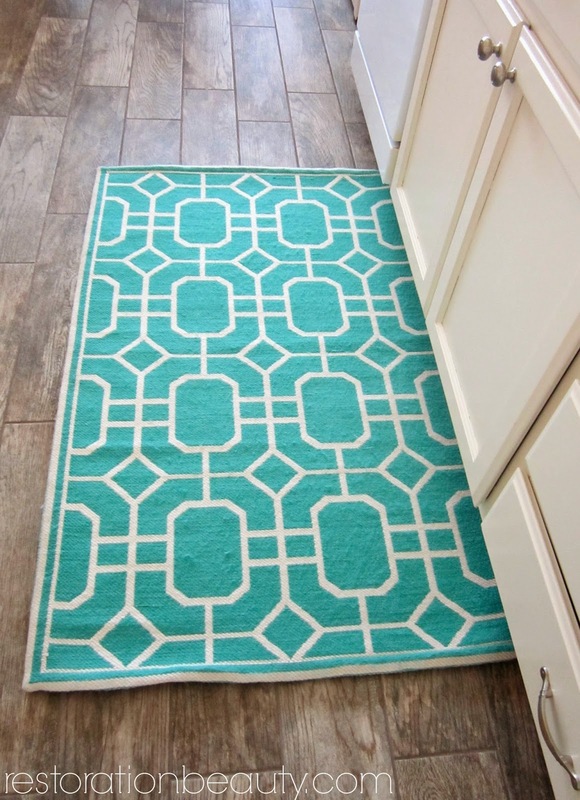 If you enter coupon code pr15off on Rug Pad USA, you will receive a 15% off your order! How cool is that? Trust me, your feet will thank you for it! 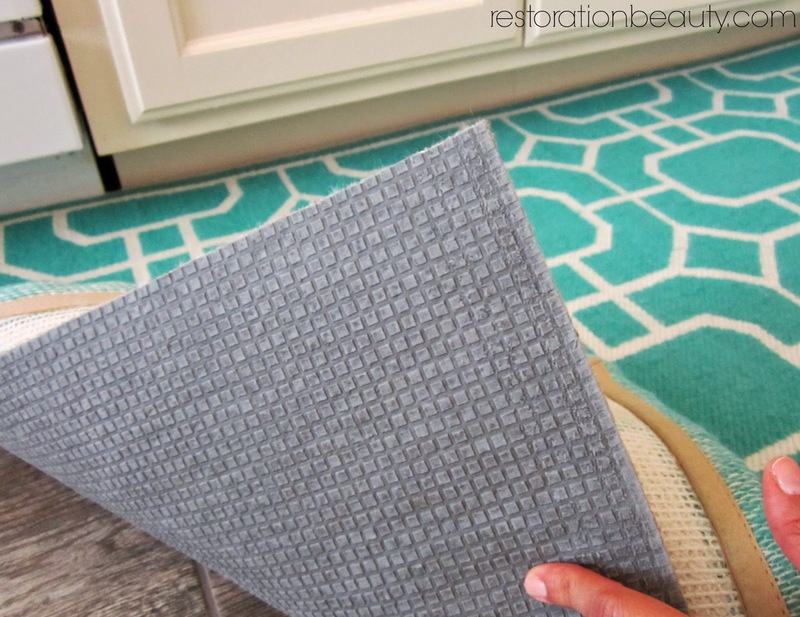 Those kind of rugs are hard to keep in place, glad you found the right rug pad and love that rug you chose too!